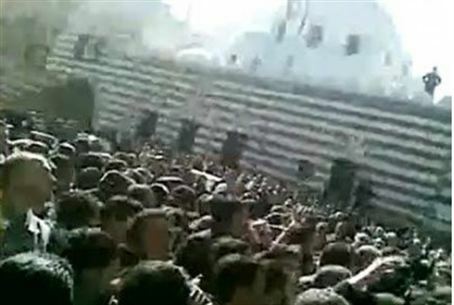 Hizbullah and Iran area helping Assad kill protesters, a Foreign Ministry source says. Iran fears its “investment” in Syria will go down the drain. Hizbullah and Iran are helping Assad kill protesters, a Foreign Ministry source says, adding that Iran fears its “investment” in Syria will go down the drain. One Israeli official said he believed Syria had "reached a point of no return,” The London Telegraph reported. Evidence of the presence of Iranian forces was provided by protesters, who reported that police and soldiers spoke Farsi, the language of Iran, which is a Persian and not an Arab country. The Foreign Ministry source told IDF Army Radio, “Syria is Iranian property, and it is clear that Iran” is trying to protect its investment. “A destabilized Syria potentially throws the Iranian military base idea out the window,” according to former CBS Middle East correspondent Dean Reynolds. “Syria has been the Lebanese overlord for decades, and Hizbullah has been Iran's meddlesome pet,” he added. “That's why you are seeing Bashar Assad shooting at his own people now. Sure, he has promised increased freedoms for discontented citizens and increased pay and benefits for state workers, but his military action suggests he knows the protesters will not be bought off by such blandishments". The uprising in Syria is following a familiar pattern: Brute force against peaceful protesters, a media blackout, the active use of Facebook and Twitter Internet social networking and YouTube video footage to get the word out, and accusations by the government that it is the protesters who are foreigners, and who are shooting mercilessly at security forces trying to maintain order. Contrary to analysts' estimates that Syrian President Bashar Assad’s grip on the country was too strong for protesters to overcome, the "wall of fear" has been broken, and activists are calling for a nationwide strike to protest the murder of demonstrators. As mobile phones and YouTube videos begin to reach the outside world, evidence is piling up that Syria, like Egypt and Libya, is covering up mass murders, theTelegraph reported. One picture showed Syrian forces using machine guns to kill unarmed protesters in Dera'a, who clearly are marching peacefully. The demonstrations have reached the capital of Damascus, and the brute force has not stopped thousands of people who continue to rally. SANA, Syria’s government news agency, insists that the rallies in Dera'a actually were to show support for “Assad's generous decrees and decisions” and protest “the conspiracy against Syria.” It quoted Assad’s media advisor Dr. Bouthaina Sha'aban as saying that there is a sedition scheme against Syria. Despite government propaganda that protesters are the criminals and that the security forces are the victims, one Syrian activist told the Telegraph by email, "The fear barrier has been broken. We are not scared any more. There is nothing more they can do to us, and it is this knowledge that is our greatest weapon." Meanwhile, Iran’s ally in Venezuela, President Hugo Chavez, has called Assad a “humanist” and a “brother.” Chavez accused the United States of exaggerating the extent of the government crackdown against protesters in order to pave the way for military intervention, similar to the Western force acting against Libyan dictator Muammar Qaddafi. "How cynical is the new format the [American] empire has invented, to generate violent conflict, generate blood in a country, to later bombard it, intervene and take over its natural resources and convert it into a colony," Chavez reportedly said. At least for the time being, however, U.S. President Barack Obama is not in a hurry to do anything except denounce the violent suppression in Syria.